Roy Morgan has today released the latest readership report for Australian newspapers for the 12 months to March 2018 and its found 16.1 million or almost 80 per cent of Australians aged 14-plus now read or access newspapers in an average seven day period via print or online (website or app) platforms, an increase of 3.2 per cent from a year ago.You can read the full report here. Four of Australia’s top five leading mastheads have grown their cross-platform audiences, with Melbourne’s The Age experiencing the strongest growth during the past year of over 10 per cent. These are the latest findings from the Roy Morgan Single Source survey of 50,014 Australians aged 14-plus in the 12 months to March 2018. Australia’s most widely read masthead is again the Sydney Morning Herald – with a cross-platform audience of 4,269,000, up 0.6 per cent from a year ago. This increases its lead over Sydney rival the Daily Telegraph which has a cross-platform audience of 3,301,000, up 0.1per cent in a year. Melbourne daily The Age has experienced the fastest year–on-year growth of an impressive 10.9 per cent and now has a cross-platform audience of 3,102,000. While the Herald Sun is the only top five leading daily to not to grow its cross-platform audience, down 4.1 per cent to 2,982,000. Australia’s two leading national mastheads have experienced divergent results over the past year. 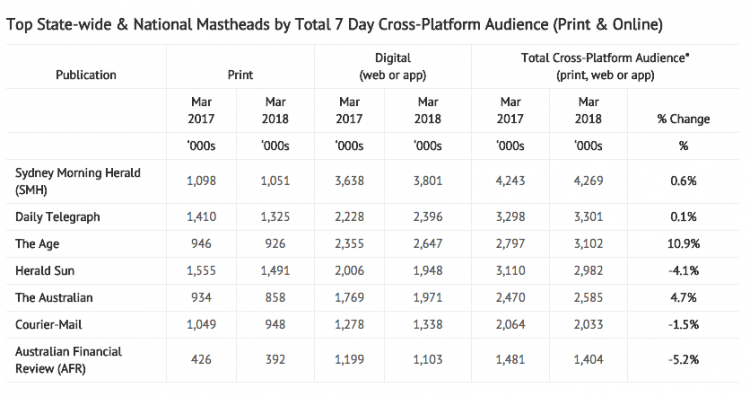 The Australian has grown its cross-platform audience by 4.7 per cent to 2,585,000 while the Australian Financial Review’s cross-platform audience has declined 5.2 per cent to 1,404,000. Overall 7.3 million Australians read print newspapers, including over 5.2 million who read weekday issues, more than 4.4 million who read Saturday editions and nearly four million who read Sunday titles. Although print readership has declined year-on-year to the early part of 2018, the latest figures show 36.5 per cent of Australians are reading print newspapers. In today’s digitally-focused world they continue to be an important advertising medium to reach large numbers in key audiences. At a state-level a bright spot was national broadsheet The Australian’s performance in New South Wales which increased its weekday readership by 15.1 per cent to an average issue readership of 107,000 and weekend edition readership by 12.6% to 170,00 in Australia’s largest state. Australia’s leading weekend newspaper is again Sydney’s Sunday Telegraph with an average issue print readership of 878,000 – down 3.7 per cent over the past year – ahead of southern stablemate Melbourne’s Sunday Herald Sun which has a print readership of 825,000 (down 3.4 per cent). Other major titles that declined include the Saturday Herald Sun down 5.7 per cent to a readership of 764,000, the Saturday Sydney Morning Herald down 4.1 per cent to a readership of 633,000, the Sunday Mail in Queensland down a sizeable 13.7 per cent to a readership of 619,000 and the Saturday Age which was down 4.9 per cent to a readership of 616,000. The AFR Weekend increased its readership by an impressive 9.6 per cent to 137,000. Driving the growth for the The AFR Weekend was the state-level increase in Victorian readership, up 32.4 per cent to 49,000. Readership of national broadsheet The Weekend Australian was down 4.4 per cent to 608,000 while Schwarz Media’s The Saturday Paper readership was virtually unchanged at 110,000. Relative newcomer Stellar increased its print readership by an impressive 16.6 per cent to 1,051,000 in the year to March 2018. Good Weekend remains Australia’s most widely read newspaper inserted magazine with print readership of 1,167,000 (down 10.2 per cent). Also performing strongly over the past year were the Financial Review Magazine which increased its readership 17.3 per cent to 401,000, stablemate Boss magazine now with a readership of 150,000 and the Sunday Herald Sun TV Guide which was up 4.8 per cent to 498,000. Other leading newspaper inserted magazines did not match these performances with Sunday Life on 695,000 (down 11.6 per cent) and the Weekend Australian Magazine on 650,000 (down 10.8 per cent). The Newcastle Herald is Australia’s leading regional weekday masthead in the year to March 2018 growing its print readership by 5.3 per cent to 79,000 over the past year. Other regional titles to grow their print readership over the past year included the Illawarra Mercury up 8.3 per cent to 39,000 and the Launceston Examiner up 15.2 per cent to 38,000. Commenting on the findings, Roy Morgan CEO, Michele Levine, said: “A record high 16.1 million Australians 14-plus access newspapers in an average seven day period either in print, or online via website or app. This represents a healthy increase of 3.2 per cent in cross-platform audience size with an extra 500,000 Australians now consuming newspaper content via one format or another compared to a year ago. “The Sydney Morning Herald again Australia’s leading masthead with a total audience of over 4.2 million, nearly a million more readers than local rival the Daily Telegraph which now has an audience of 3.3 million. “The strongest 12 month performance was by Fairfax daily The Age which grew its cross-platform audience by over 10 per cent to 3.1 million. Almost matched in audience size by its Melbourne competitor the HeraldSun at just under 3 million. “The take out from today’s readership figures is that Australia’s leading mastheads are continuing to build large and diverse digital audiences to replace declining print readership. As time progresses consumers of news will increasingly look to trusted media brands and outlets for the latest news.